Should I buy T&N Mint or Stick with the Original? Short answer, the Mint is well worth the extra money to upgrade from the original. Now, I’m not here to spend your money so it is your choice. But, let me say this; the Mint is on the same level as all of the top mattresses that I have tested in the last 3 years. In many cases it is far less expensive. I’m giving you the TLDR upfront, but you can keep reading about why I think the Mint is a steal. Choosing the right mattress shouldn’t be a nightmare. But we are constantly worried, we ask ourselves very often, almost every single day: “Did I make the right decision?”. Some of you ask their friends about products they are purchased, others go online to read reviews. BUT not all reviews are accurate sadly, maybe back in the days, but nowadays I feel like there’s a lack of trust. That’s one of the reasons that prompted me into doing what I do. I want to share my experience when it comes to buying one of the most important items in your household. Your mattress! Throughout our lives, we spend an enormous 26 years sleeping. Surprisingly, we also spend 7 years trying to get to sleep. That’s 33 years or 12,045 days spent in bed. That alone being said, YES A MATTRESS IS THE MOST IMPORTANT, if not the most valuable, INVESTMENT, ITEM, ASSET you can ever yet. And today I am here to help you decide exactly what to chose or which mattress to invest in. After all we are all thriving for a better, happier life. One of the things that makes us happy? Any guesses?? A GOOD NIGHT SLEEP. And how do we achieve a Good Night Sleep? By choosing the right mattress. 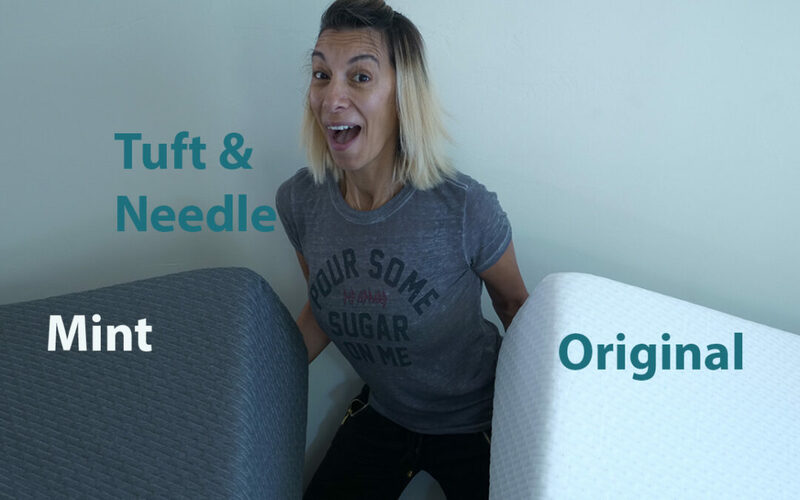 Here I have 2 examples, The Original Tuft & Needle, the one that started it all and the all new upgraded mattress, also from Tuft & Needle, the Mint. Obviously they both come from a great background and an amazing company. But that’s just not enough. What matters is the results, the outcome. That is what we are seeking here. I personally sleep on all mattresses I receive. I test them, I share them with my kids, my husband, my dog. I test them in every possible way to make sure I share exactly how I feel about them, what I like and what I don’t, and to let you know and suggest whether they are worth it or not. That was the case here of course, I have received both mattresses from Tuft & Needle. Placed them on two separate beds of course and tested them. I won’t bore you with details on why, where and how but I am going to tell you immediately which one I preferred over the other. I have nothing against the original one. But after spending a few nights switching between the Mint and The Original, I have found myself wanting to spend more time and more nights on The Mint. While the original mattress has optimal support, cooling, comfort and pressure relief. The Mint tends to have the same features as the original mattress, except those features were upgraded, plus they added an extra layer. I have also noticed better edge support and extra cooling. The Mint is like the premium version of the Original Tuft & Needle. I’m going to make it easy on you and break them down layer by layer including their functions and let you decide which one to choose. As for me, I have chosen the Mint simply because it’s going to be my permanent mattress and I seek supreme comfort when it comes to picking the right items in my bedroom, my sanctuary. As for the original Tuft and Needle, and if I had to go with it, I would make it my guest bedroom mattress. After all it delivers amazing comfort at an unbeatable price. Pressure relief: The Tuft and Needle has only 2 layers. Simple, basic yet just what you need for great pressure relief without sinking in the mattress. The Tuft and needle Adaptive Foam captures the best benefits of memory foam and latex while leaving their negative attributes behind. Support: What makes this mattress special is its support layer that provides the ideal base for a full night’s sleep. The more pressure you put on it, the more it reacts to support you. Without support, a mattress may only be comfortable for a few hours. Cool Sleeping: In addition to the heat wicking graphite and cooling gel found in the original Tuft and Needle Adaptive foam, the cover is extremely breathable keeping the sleeper cool. The original mattress is one of the best mattresses out there. But that wasn’t enough, so they improved it and created something even BETTER, The Mint! This 12” thick mattress is made out of three layers that work together to provide remarkable support that you will find comfortable immediately as well as throughout the night. In this mattress they made sure they increase the softness of the top layer for better pressure pressure relief, as well as the firmness of the bottom layer for extra edge support, and to top it all off, they added a middle transitional layer for even better, improved comfort and support combined. The cover: The Mint Cover material is thick, durable and amazingly breathable. It’s soft you can almost sleep right on it. I’m also a big fan of that unique color. The Top layer has extra graphite to maximize the cooling factor. They also optimized it to make it a progressive combo to meet comfy and pressure relieving. In the 2nd layer they added more gel beads for cushion-like support and feel. The base layer is definitely more supportive and firmer adding comfortable edge support. The open-cell foam technology is designed to allow air flow freely through the mattress, increasing breathability. Of Course the Mint is Better (It Costs More)! I can’t stress this enough, the original is a great value and anybody would be happy with it in their spare bedroom. However, if you consider the many years that you are going to get out of your mattress it is WELL worth the extra money to step up to the Mint. The step up is so huge that it is hard to even consider it an apples to apples comparison. The covers are similar the feel is close, but if you have the chance to sleep on either one on any given night there is no way that you wouldn’t choose the mint as your preference. T&N ships compressed in a box, for free, straight top your door. Works on slatted frames, adjustable frames as well as box springs. Best part, you get to try your Tuft & Needle for 100 night risk free. Here are the current prices of the two mattresses available online.